I have a special knack for recognizing buildings that would make good funeral homes. It’s true; sometimes I’ll spot a bank or a church or a library and I’ll think to myself, “that building missed its calling – it should have been a funeral home”. I wasn’t born with this gift; it was definitely a nurture over nature kind of thing. You see, my dad is a funeral director and in addition to a myriad of other unusual things that I learned while growing up the daughter of a mortician, I also learned what kind of buildings would make the best funeral homes. In appearance, the perfect funeral home is serious but not stuffy; elegant but not gaudy; somber but not depressing. It needs to be away from any noisy intersections, have adequate parking and be large enough to be accommodating but not so large as to become impersonal. You were about to make the My Girl reference weren’t you. Yeah, so has just about everyone else I’ve ever met. That’s the thing about parents’ careers – you wind up knowing a fair amount about them. The same goes for whatever your spouse does for a living. Andy, as you know, is an electrician and while I wouldn’t go so far as to say I could install an outlet without setting a house on fire, I have started noticing things that only an electrician (or one’s spouse) would notice. This is especially true in other countries. Here are my favorite things about traveling with an electrician (other than the fact that the one I travel with also happens to be charming, handsome and pretty much all around wonderful). 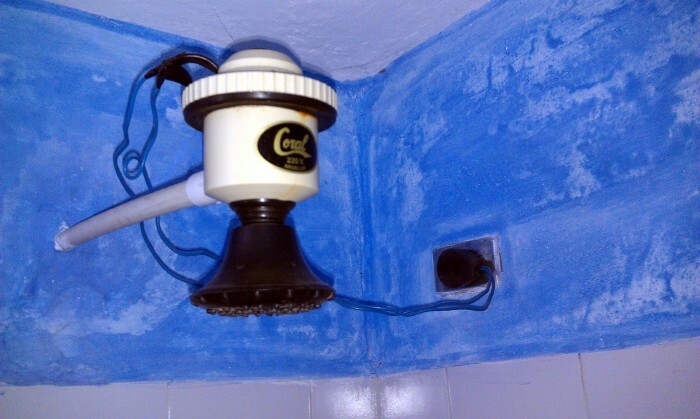 Another shower, this time in Guatape, Colombia. It’s also safe. 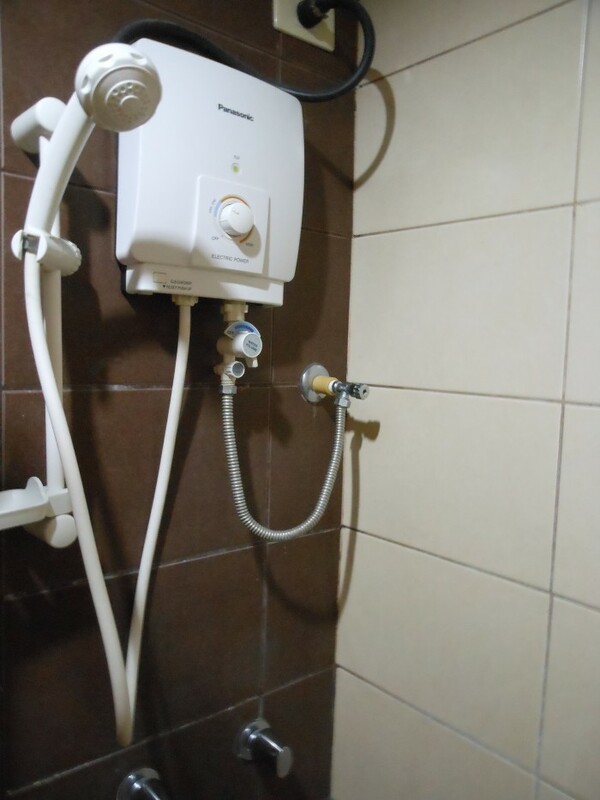 Most of the showers that I’ve seen in other countries have these sort of electrical water heating devices; the ones pictured are pretty typical. That being said, they can be a little unnerving at first – especially when you can feel the electricity pulsing through the water. But, that’s their system and Andy says for the most part, they’re probably safe – which is good to know. I’ll pass on what I’ve been taught. 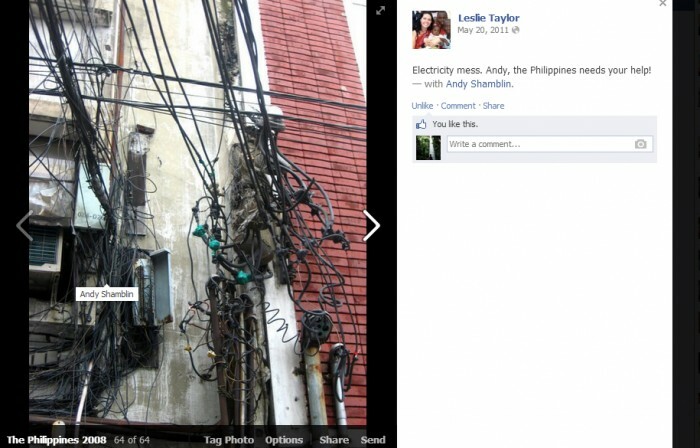 We all know we need outlet converters in other countries. Here’s a chart. Here are the outlets of the world. Follow this link to a good reference website that lists what outlets are used in what country. 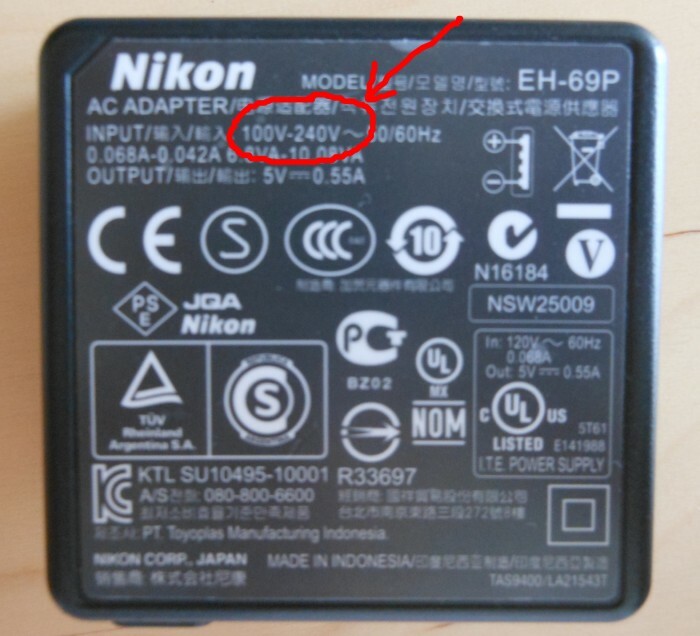 This means that this camera charger is approved to be used any place that uses anywhere between 100-240 volts. 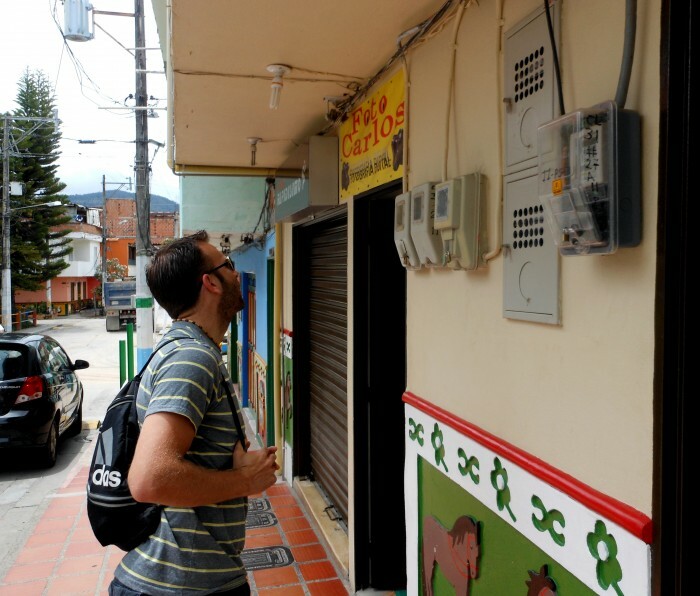 Not sure where to find a country’s voltage information? Check here under the ‘electrical potential’ column. Which I probably wouldn’t have noticed otherwise. 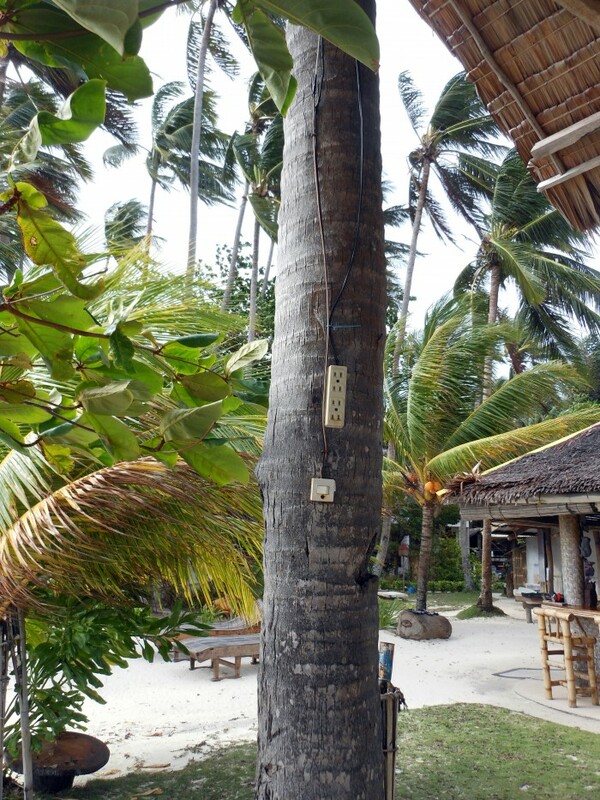 In case you have to plug something in while sitting under this palm tree in the Philippines. This is in Manila. These black power/phone lines were everywhere. 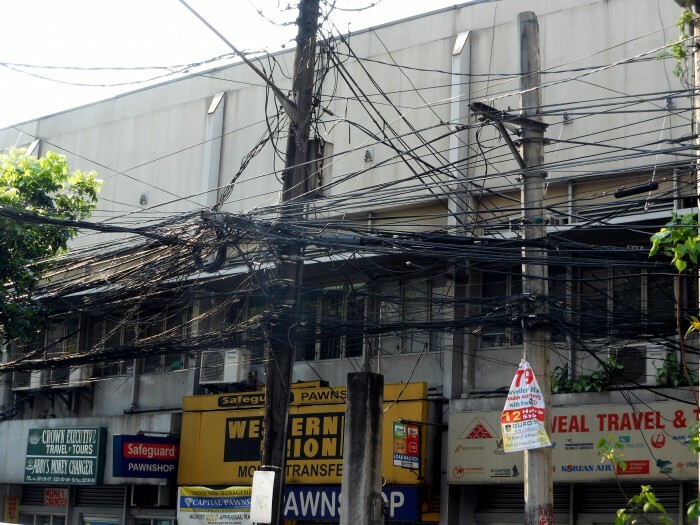 I’ve seen some crazy power lines in my day, but nothing comes close to what I saw in Manila. It’s kind of endearing, but a little less so when my tummy is rumbling. having worked with many linemen and electrical engineers in my career, I can totally relate to this and laughed a lot along the way of reading this…very well done!! Haha! I wish I could travel with someone who would give me a safety heads up about stuff! Outdoor electrical outlets, shocking showers, baboons, hyenas warthogs (well maybe at least about the first couple of things! ).